Grab your office chairs and hockey sticks and get ready for the reintroduction of Goodmans Chair Hockey Tournament, hosted by Goodmans Interior Structures and produced by Rooted in Good, Inc., an Arizona 501(c)3 operated by Goodmans employees. This year’s event benefits First Place® AZ, a local non-profit working hard to ensure that housing options for people with autism and other special abilities are as bountiful as they are for anyone else. 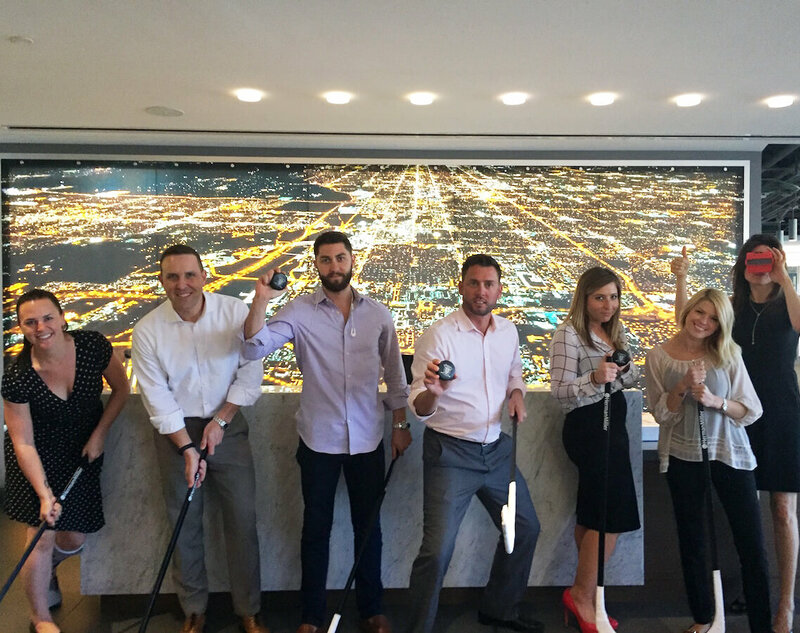 Cresa prepares to compete against other commercial real estate teams during Goodmans Chair Hockey on Oct. 20 which will benefit First Place AZ, a local nonprofit serving adults with autism. Filled with good people, good times and a great impact, the spirited chair hockey event is being held at 5:30 p.m., Thursday, October 20, at the Goodmans Showroom, 1400 E. Indian School in Phoenix. While competitive teams are by invitation only, hundreds of people are expected to come and cheer on their favorite of the 16 real estate industry rivals which include architects, interior designers, general contractors and commercial real estate brokers. Competitive professionals will playfully show off their creative moves and athletic skills while seated in Herman Miller office chairs. Through the collection of tournaments from 2002 -2006, Goodmans donated more than $75,000 to the Southwest Autism Research & Resource Center (SARRC). October 20th will be one large Throwback Thursday. Proceeds are benefiting the First Place capital campaign, now underway, that supports First Place-Phoenix, a new residential property being developed at 3rd Street and Catalina, in the heart of the city. 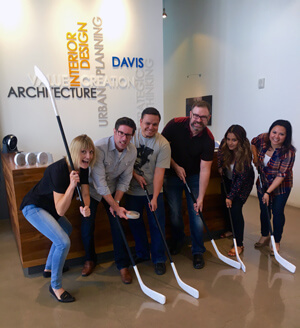 Davis prepares to compete against other commercial real estate teams during Goodmans Chair Hockey on Oct. 20 which will benefit First Place AZ, a local nonprofit serving adults with autism. “We scored big, thanks to Goodmans Interior Structures and our friends throughout the real estate community who have made our progress possible, generously committing their time, talent, resources and can-do, will-do, gotta-do spirit!” said Denise D. Resnik, First Place AZ founder and president/CEO, and SARRC co-founder. This year’s key Chair Hockey sponsors include Herman Miller, Wells Fargo and Henry & Horne. The concept of chair hockey is similar to ice hockey, except in chair hockey, all players are seated in ergonomic, award-winning Herman Miller Aeron chairs. The games are played in three, four-minute periods with a rubber puck and wooden hockey sticks in a rink enclosed by cubicle walls. VISUALS: Architects, interior designers, general contractors, and commercial real estate brokers will be playing chair hockey from office chairs. Guests and media will enjoy good-natured competition and friendly banter in the spirit of helping First Place AZ, a nonprofit serving adults with autism. Students from the First Place Transition Academy also will be present.